WHAT ELECTRIC VEHICLE INCENTIVES ARE AVAILABLE? Want to Keep Up to Date on the Latest Incentives? Click here to check out the ARB PEV incentive finder. The Internal Revenue Service offers Federal Plug-in Electric Vehicle Tax Credits for up to $7,500 for purchasing new electric vehicles. Battery electric vehicles qualify for more whereas plug-in hybrids qualify for less. The California Clean Vehicle Rebate Program provides eligible applicants a rebate of $1,500 to $4,000 towards the purchase or lease of a new electric vehicle, depending on the vehicle type and income of the applicant. The rebate increases for low income households. Battery electric vehicles qualify for more whereas plug-in hybrids qualify for less. El Dorado County Drive Clean! Incentive Program offers their residents a $1,000 incentive for the purchase or lease of a new electric vehicle. Preapproval is required, and applicants must agree to own or lease the vehicle for at least three years within El Dorado County. In California, the Air Resources Board (ARB) provides electric vehicles with access to carpool lanes. California electric vehicle drivers can save on insurance discounts. Farmers Insurance provides a discount of up to 10% on all major insurance coverage for electric vehicle owners, while AAA offers up to a 5% discount. On the Nevada side, electric vehicles are exempted from Nevada’s emissions testing requirements. 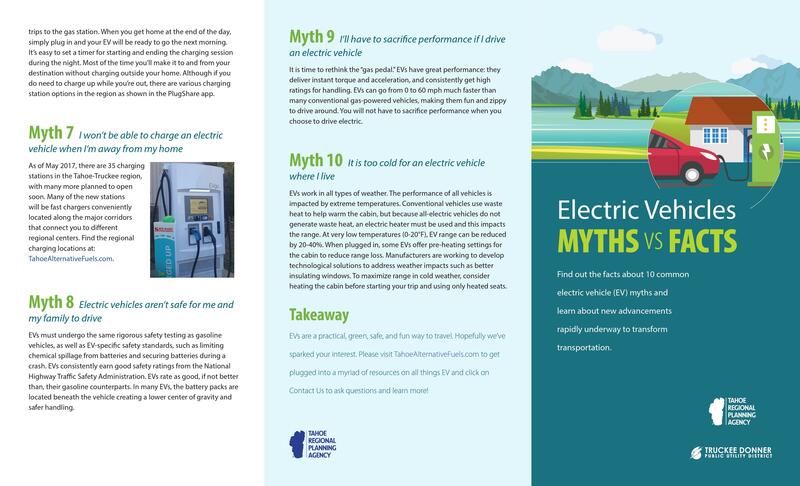 PG&E (Pacific Gas and Energy) offers a $500 clean fuel rebate for customers owning an electric vehicle. The clean fuel rebate comes from the CA Low Carbon Fuel Standard Program. Liberty Utilities offers a discounted Time-of-Use rate for electricity with a 14 to 18% reduction. Contact Liberty Utilities at: 1-800-782-2506. NV Energy offers a special 12% reduced electricity rate for electric vehicle owners located in northern Nevada. This special Time-of-Use rate is available from 10 pm to 6 am. Contact NV Energy at: (775) 834-4444 or nevadateam@nvenergy.com. Want to see how much you could save on fuel costs if you drove electric? When gasoline is priced at $3 per gallon, it costs 55-83% less to drive a mile in a 20167 Nissan LEAF than a 2016 Honda Civic gasoline vehicle. WHAT ELECTRIC VEHICLE CHARGER INCENTIVES ARE AVAILABLE? The Federal Transit Administration offers financial assistance for research, pilot demonstration, and deployment of low or zero emission public transportation vehicles. Funding may cover up to 80% of project costs, with a required 20% non-federal cost share requirement. Eligible vehicles must be designated for public transportation use and significantly reduce energy consumption or harmful emissions compared to a comparable standard vehicle. The California Energy Commission provides loans for up to $500,000 for the design, development, purchase, and installation of electric vehicle charging infrastructure at small business located in California with 1,000 or fewer employees. California Counties offer Property-Assessed Clean Energy financing for installing residential chargers. This program allows property owners to borrow funds to pay for energy improvements, including purchasing and installing an electric vehicle charger at their home. WHERE ARE ELECTRIC VEHICLE CHARGERS? Today, a variety of electric vehicles are available with more all-or-four wheel drive options emerging. Use the Pick-a-Plugin quiz to find vehicles best fitting your travel needs and budget. The diversity of models available to consumers is expanding and changing rapidly. For instance, several manufacturers are introducing electric powered mini-vans, crossovers, and SUVs. Check out FuelEconomy.gov and the Alternative Fuels Data Center for the newest electric vehicle offerings. Plug-in hybrid electric vehicles (PHEVs), like the Chevy Volt, have both an electric motor and a gasoline engine. Battery electric vehicles (BEVs), like the Nissan LEAF or Tesla Model S, run solely on electricity. 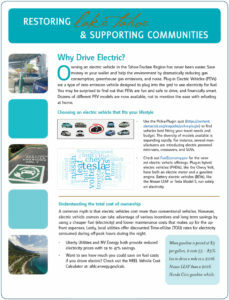 WhAT DO I NEED TO KNOW ABOUT DRIVING AN ELECTRIC VEHICLE? IS IT SAFE TO CHARGE MY ELECTRIC CAR? HOW FAR CAN I DRIVE WITH ELECTRIC? HOW MUCH CAN I SAVE DRIVING ELECTRIC? WHAT’S DIFFERENT AND EXCITING ABOUT DRIVING ELECTRIC? WHAT ARE THE 3 TYPES OF PLUG-IN CARS? Collaboration with partners across the region is a crucial ingredient for effectively building a coordinated network of charging infrastructure. No one organization can accomplish this on its own. 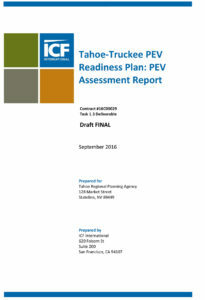 TRPA, the Truckee Donner Public Utility District and the Tahoe-Truckee PEV Readiness Council worked together successfully to develop an action-oriented readiness plan that provides recommendations and a road map for moving forward. 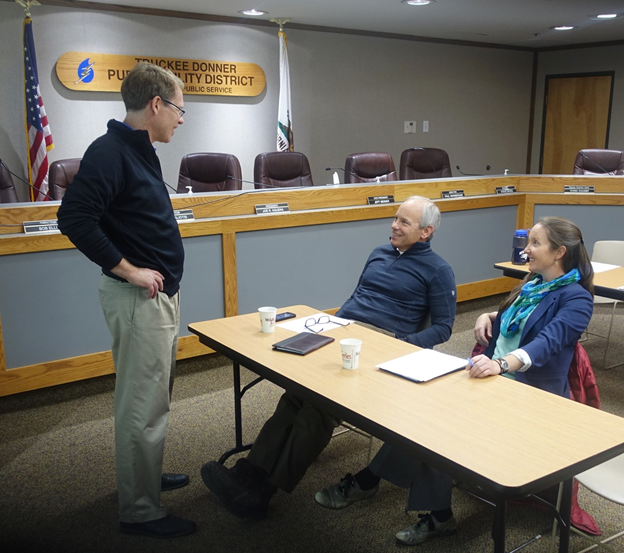 The cross-regional council includes representation from different local and regional government agencies, local utilities, school districts, business/tourism associations, ski resorts, and environmental groups. The council supports engagement and education, resource development, and the implementation of a convenient user-friendly charging network. The council’s mission is to implement the plan, and act as the regional facilitator to make the region a widely recognized zero emission vehicle destination. 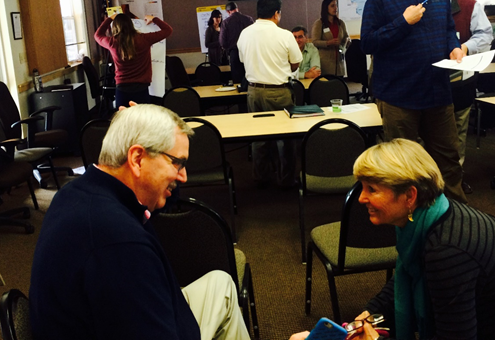 TRPA is committed to coordinating council work, facilitating partnerships for needed projects, leading regional planning, monitoring performance, and providing education and resources. We thank our partners for their contributions. 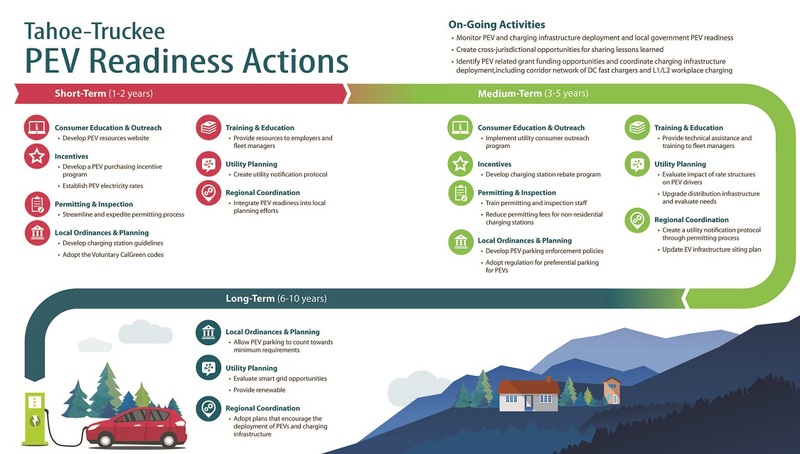 FHWA developed a toolkit with a library of curated resources related to finance and planning for AFVs. 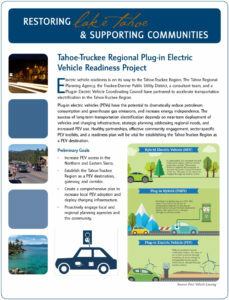 Truckee Donner Public Utility District Electric Vehicle Resources. State of California Zero Emission Vehicle Program. 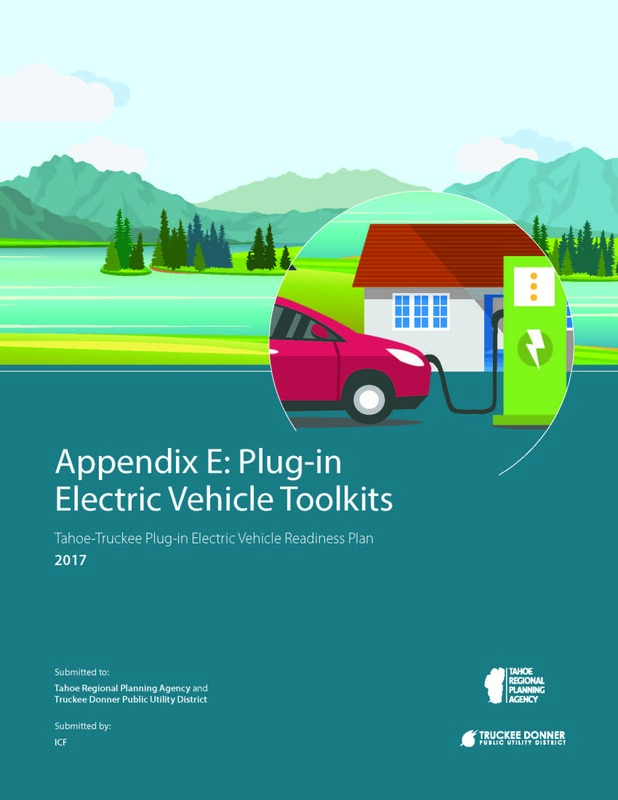 State of Nevada Electric Vehicle Programs and Resources. Electric Auto Association of Northern Nevada. Electric vehicle infrastructure training for an electrician helps ensure that electric vehicle supply equipment is properly installed to the highest standards. City of South Lake Tahoe requires a design review and then a building permit application. 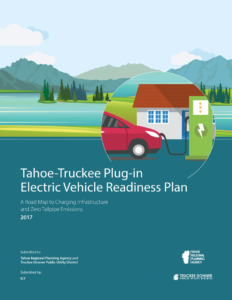 Town of Truckee offers a Zoning Clearance for chargers through the building permit process. 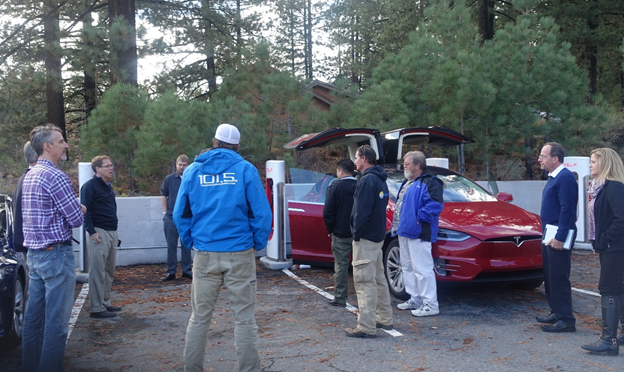 Placer County requires a plan for a single line diagram and electrical panel calculations including the charging equipment location and accessibility. Do You Need to Add New Concrete for Installing a Charger? In Tahoe, if you need to add more than 7 cubic yards of new concrete, you need a TRPA grading permit. If under 7 cubic yards, you simply need to submit a qualified exempt application.